Use the center circle, or create a circle with cones the size of the center circle. Start with six players in blue and six players in red. The red players start outside the circle. The blue players start inside the circle with a ball each. The blue players inside the grid pass to an outside player and receive the ball back from the outside player and move across the circle to pass to another outer player. Players must go through the center of the circle but avoid other players. 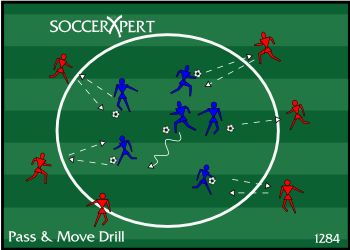 Players should pass and move. Change the groups every 5 minutes. Make sure the players put the proper weight, accuracy, and timing of each pass. Players should control the ball into space with their first touch. Players should use all foot surfaces. Players should be reminded to keep the ball moving at all times. Remind players to accelerate with power after receiving the pass. Players should be aware of their surroundings and continue to communicate with their teammates. Split into 3 groups of 4 players each with different color bibs. The new group will become passive defenders who are responsible for marking the 4 attacking players inside the circle. The remaining 4 players spread out on the outer side of the circle. The attacking team will only play with 2 balls. The ball must be played in by one attacker and received by a different attacker on the same team.